Photo: Paul Wellman Kevin Bourke in his Santa Barbara office. Kevin says financial planning is “kind of like driving — if you panic, you make a mistake.” Emotions should never drive the decisions. “People who end up with the most are the ones who don’t pay attention to the daily swings,” explains Kevin, who’s worked in the field of financial management since 1987. Living, working, and making a difference in Santa Barbara is a childhood dream come true. “I used to come here as a teenager,” he remembers. “I’d go to Rocky Galenti’s.” He recounts seeing men in suits in our idyllic city and saying to himself that if these men can do it, so can he. “All roads lead to Santa Barbara,” he likes to say. He was born in Ypsilanti, Michigan, but his parents moved to Woodland Hills when he was two years old. “The house we lived in was condemned,” he explains. His mom was a homemaker while his dad cleaned pools. “Finance was a window into a world I knew nothing about, “ he says. After graduating from El Camino High in 1982, Kevin contemplated becoming a minister. A family friend, Bill Parodi, who worked for EF Hutton, encouraged him to take classes to become a stockbroker. Parodi opened his own company in Woodland Hills, and Kevin worked with him until 1989, when Shearson Lehman Hutton came calling. 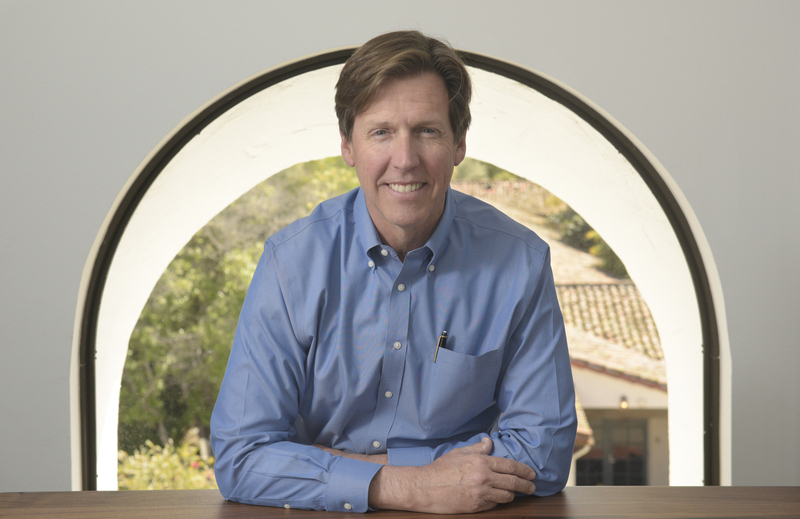 In the mid-1990s, Prudential brought Kevin to Santa Barbara. His first daughter, Olivia, was born at Goleta Valley Hospital. He recollects those brief years as living more like a tourist in our city. Smith Barney gave him an offer he couldn’t pass up to move to Vegas in 1995, and he stayed there for eight years, eventually opening his own firm. “The best thing that happened in Vegas was that my daughter Rachael was born there,” he confesses. Upon returning to Santa Barbara, he had two experiences working for single older women who were about to make big mistakes with their finances. “In both cases they listened to me,” he says. “These women would have been on the streets.” They are both still his clients. Kevin Bourke answers the Proust Questionnaire. “Always do the right thing.” Really, if you always do the right thing, it’ll always turn out well. And if for some reason it doesn’t turn out well, at least you’re happier in the meantime. I had to ask others for this one. Generosity was the answer. I believe that whatever we have is meant to be shared and help others less fortunate. Unfulfilled potential. When I think of people who are really gifted at what they do, I think, “What if they had never practiced their craft or honed their skill or taken it for granted?” What if Meryl Streep had never taken up acting? What if there is something out there that I’m really good at that I never even try, or worse, that I’m afraid to try? Finance is a mysterious black box that confuses most people. I love to simplify the complex and watch my clients take a deep breath and relax. Recently, I had the great pleasure of having my daughter, Olivia, join the team. Working with her has brought a freshness to my 32-year career. To live untethered to technology. Cell phones, computers, iPads, software upgrades, random error messages. There are many things about technology that are wonderful, but I remember when my pencil broke, I’d walk to the sharpener. Problem solved. Boyan Slat and other young people like him. Boyan is a young Dutchman who, as a teenager, invented Ocean Cleanup, which at this moment is clearing plastic from our oceans. The beautiful thing about young people is that, unlike adults, they don’t know a given task is impossible, so they just do it. Napping on a beautiful Santa Barbara afternoon. It just feels so decadent to sleep while the sun is shining. Incredibly excited for the future. I’m newly married to an amazing woman, business is flourishing, my family is healthy and happy. I wake up happier each day. Kindness, without question. We are each here for such a short period of time. I can’t fathom why we aren’t all just nice to each other. I mean, really? Maybe snobbery, people who gauge their worth by money and treat as lesser those who don’t have their same level of wealth. One of the things I love about Santa Barbara is that it is home to some of the wealthiest people who are also some of the most thoughtful, intelligent, generous, and kind people. That they want what’s best for those around them. I love people who put others’ needs first and I attempt to emulate that quality daily. Dancing. My wife loves to dance so I dance with her because she loves it. But I don’t know how to dance and certainly don’t dance well. If I could dance better we’d all be so much better off. I’m quick to pass judgment. It’s a trait I work on daily, although those around me would probably say it’s hard to tell if I’m making any progress. I was raised in a very controlling religion. They threatened that if I were to leave I’d lose my friends and family. When I left, sure enough, I did lose all my friends and nearly all my family. But I’ve been compensated so many times over by loving relationships that I could never imagine having had in the church. Somewhere near the ocean with moderate weather. I’d like to have the sea on one side and mountains on the other. It would be nice to have concert halls, beautiful places to walk, friendly people and islands in the distance. So…Santa Barbara. I dreamed about living here when I was younger. I would visit and see men walking around downtown in suits. Few people vacation in Santa Barbara wearing a suit so I knew they must have figured out a way to make a living here. I figured if they could do it, so could I. Just before my 40th birthday I vowed to myself that I would spend my forties living in Santa Barbara. Now I’m halfway through my fifties and could not be happier I made that decision. As a gift, my daughter Olivia made me a picture that says, “That which can be seen, heard, experienced, these are what I prefer.” She has a pretty good idea of what I like. Things aren’t that exciting to me. Travel, having good friends, being able to walk in beautiful surroundings, it’s things like this that I prize, by far. Anyone who knows me knows the answer to this: my wife, Diane. Seriously, it’s like living with a stand-up comedian, without the angst. I watch her go and just wonder where it comes from. If I had to pick a second, at the moment, John Mulaney makes me laugh hardest. When I think it will protect the people I love. But I’m also a believer that telling the truth and letting the chips fall where they may is preferred. It’s just too hard to keep track of lies, so why bother with the hassle?